Tricopigmentation is a technological evolution of aesthetic and paramedical micropigmentation which allows to inoculate into the superficial layer of the Dermis a specific pigment capable of altering appearance by recreating the effect of a thicker scalp. 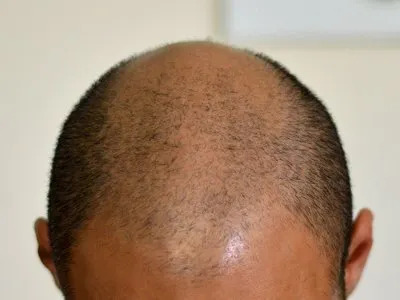 Tricopigmentation is a technique which allows our customers to mask baldness (hair loss) in the most suitable way depending on the customer’s initial situation. 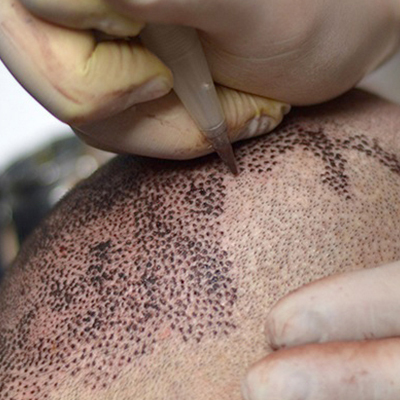 By performing this type of treatment, the shaved effect is achieved using a microscopic deposit of pigment, in the shape of dots. The aim is to obtain a natural result. Tricopigmentation is reversible, non-allergenic and bio-compatible thanks to the use of specific pigments which can be absorbed by the body. A fundamental role is played by the competence and the experience of the technician, the training undertaken and the equipment used. The duration of the treatment and the number of sessions depend on the characteristics of the patient and of the areas that need to be treated. Since Tricopigmentation is a reabsorbable treatment, the practitioner will evaluate, together with the customer, the number of sessions for annual mantainance (touch-ups are usually performed once or twice a year) to always ensure the best result. 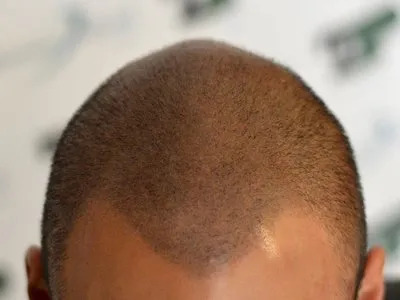 Tricopigmentation, the evolution of scalp micro-pigmentation, is now internationally recognized especially in the field of hair restoration surgery and it is now ascertained that the two techniques can not only co-exist but also state their maximum potential together providing quick and non traumatic results and representing the perfect solution to baldness. The advantage of the technique consists in being both integrative and alternative to surgery. Our company is the only one which can guarantee a training which was approved by the Italian Society of Trichology (Si.trI) during the Italian Congress of hair restoration surgery, in Rome, on May 27th 2012. The world of surgery chooses Beauty Medical and its Technical Director Milena Lardì because of her reliability, the numerous feedbacks, her results and experience. By choice or necessity, Tricopigmentation with shaved effect aims at reconstructing completely the scalp with a “shaved look”. Shaved Effect on longer hair. 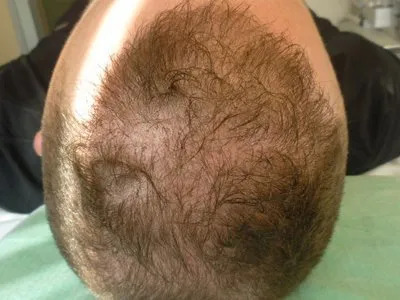 Among Tricopigmentation treatments, the shaved effect allows to optically rebuild the coverage of the hair at a length of 2mm, all over the scalp and in case of totalis and areata alopecia too. In the maintenance sessions, the effect keeps on getting better thanks to the optical tridimensional illusion that can be achieved after the treatment. This process is possible thanks to Beauty Medical system and to the use of bio ri-absorbable pigments. This is a solution for who wants to keep an hair shaved look, but also for who needs a natural coverage on longer hair. The density effect allows the patient to have a thicker look and better coverage even in case of long hair. It helps avoiding camouflaging products. 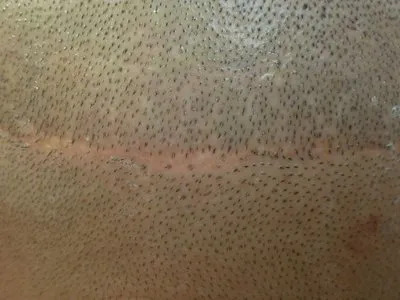 Among Tricopigmentation treatments, the density effect has substituted the outdated “dot-hair” and guarantees the coverage for who wants to keep a not shaved cut, ensuring a great naturalness and allowing to shave even in the short term. This technique can guarantee a reduction of the transparencies, of the discolouration between skin and hair and it is a great semi permanent camouflage. Guessing realistic expectations, this method is the best one possible in order to hide the thinning without giving up on one’s freedom. The right expectations make it a comfortable, long lasting and not binding treatment. Used to camouflage scars caused by surgery procedures, hair transplant (FUE and STRIP) or accidental injury. It limits the pink effect. Trauma scars or post-surgery scars can be an aesthetic and psychological problem and may lead to dysmorphism. Therefore, it is a priority to obtain a good looking result in the short term without getting damaged by technical mistakes. The number of necessary sessions can vary depending on the individual. After a previous evaluation, Tricopigmentation allows to cover areas with scars due to traumas or surgeries. In Most cases Tricopigmentation is painless, it does not require the use of local anesthetic creams unless it is carried out after surgical procedures. For a dense, uniform and homogeneous effect three sessions are necessary. In case of alopecia areata or totalis time is variable. It will require annual touch-ups. The choice and experience background of the practitioner is the sole discretion of the user, Beauty Medical can guarantee quality standards thanks to more than 1,000 cases handled and performed. Beauty Medical uses only specifically designed Tricopigmentation equipment, which was studied for scalp tissue. Tricopigmentation is a technical evolution of aesthetic and paramedical micropigmentation which allows to inoculate into the superficial layer of the Dermis a specific pigment capable of altering appearance by recreating a thicker scalp effect. This microdeposit has the ability to alter the appearance of the treated area by recreating the desired optical effect. 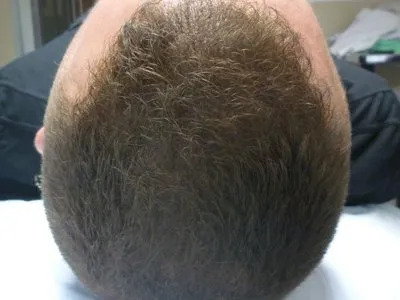 Tricopigmentation, unlike scalp micro-pigmentation, can offer high quality standards and successful results thanks to a patented system specifically tested on scalp tissue and designed for this type of treatment. The machine represents one of the company’s strengths and it was created as a result of specific requests made by the Beauty Medical Technical Director Milena Lardì. After several scientific tests about pigment stability and resorbability Milena came up with a valid project. The result is a system which can recreate a natural effect. Specific tip applicators, characterized by engines which were specifically created for Tricopigmentation, a defined number of beats of the handpiece, specific needle diameter and porosity, reabsorbable pigments and specific products designed for the scalp tissue are the winning formula of the Beauty Medical system. Tricopigmentation Frequently Asked Questions, better known as TFAQ, allow our Customers to satisfy their request for information in a quick and complete way regarding the treatment procedure, the technique or the pre and post treatment care. In the last section you can also find answers to questions about dermatology, surgery and baldness in general. Tricopigmentation is an evolution of micropigmentation. A specific system, a tested equipment, peculiar pigments and needles allow us to offer perfect results. The spreading of pigment in Tricopigmentation as in micropigmentation is a natural phenomenon which is caused by the nature of human dermis. The evolution of the pigment is almost imperceptible and it is directly proportional to the initial shape and size of the original deposit at the moment of the procedure. A well-performed treatment shouldn’t change in dimention and should therefore remain unchanged for several months. On the other hand an untrained technician may inoculate by mistake an eccessive quantity of pigment wich will immediately evolve into macro-dots. The difference between a tattoo and a tricopigmentation procedure stands in the physical/chemical composition of pigments. The micro- and tricopigmentation particles are synthesized in laboratory so that they become hypo-allergenic. Metallic powders, after being micronized, weighted etc., are encapsulated in a sort of similsiliconic membrane, which prevents them from damaging the skin. IS IT ADVISABLE TO HAVE A PATCH-TEST PRIOR TO THE TRICOPIGMENTATION SESSION? The tests we carry out before Tricopigmentation are only designed to understand whether certain tissues, such as scars, can be treated. They are not allergy tests. The practitioner, as well as the tattoo artist, does not have the skills to do a patch test, which must be therefore carried out by an allergist. We want to continue working with serenity and of course we don’t want to endanger our patients. Definition: A toppik is a compound of keratin fibers, which gets electrostatically charged and is able to anchor to the indigenous hair in order to increase hair density. Can Tricopigmentation be compared to toppik? The answer is NO. Tricopigmentation is often compared to a concealer, dermatch, but on a practical level, of course, these two solutions are completely different. Tricopigmentation does not create any damage to the miniaturized hair, indeed, since I deal with it on a daily basis I asked for the opinion of Dr. Tesauro who stated that the action of the needle (if performed by trained hands) does not create damage to the hair but on the other hand creates hyperemia (the blood reaches the dermis surface)… A real benefit for all alopecia cases. 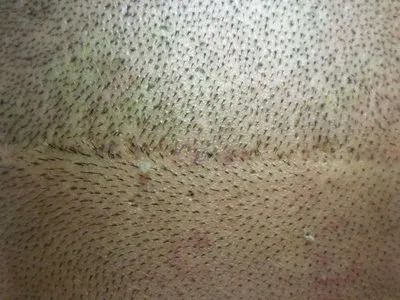 In a lot of cases, after Tricopigmentation, totally hairless areas can show light hair growth. CAN TRICOPIGMENTATION BE USED TO MASK THE BEGINNING OF HAIR LOSS IN WOMEN? Yes, any case can be treated successfully, of course if the patient still has enough dentity. Don’t forget that micropigmentation is seen as a support to medicine with reference to aesthetic problems. Deseases such as Vitiligo can be treated in order to improve the aesthetic appearance or reduce the psychological suffering of the patient. REVERSIBILITY OF TRICOPIGMENTATION, WHERE IS REALITY? Tricopigmentation is a methodology which was specifically designed to be absorbed by human body in the medium term. The pigments are characterized by a molecular structure which is very different from that of tattoos (the size is much smaller). This feature allows our body to eat the powders contained in the pigments, providing (at least in theory) the total vanishing (within 2 or 3 years optically and at least twice as long in the dermis). HOW LONG DOES THE EFFECT OF TRICOPIGMENTATION LAST? The effect of Tricopigmentation lasts for about 6 to 18 months, depending on the patient, on the skin type, on the immune system, on the patient’s habits, on the applied technique, on the treated area and on the pigment. Pain is a very subjective and personal factor. However, the use of innovative products and equipments reduces pain and usually patients feel just a light bother. HOW LONG DOES A TRICOPIGMENTATION SESSION LAST? The first tricopigmentation session lasts on the average about three hours and the second one about two hours. This depends on the area and on the scalp skin quality we are treating. HOW LONG IN BETWEEN THE FIRST AND THE SECOND SESSION? The time required by the dermis for the initial healing is about 24 hours. Once the excess of pigment is expelled we can carry out the second session successfully. SEBORRHEIC DERMATITIS AND TRICOPIGMENTATION, WHAT PROBLEMS MAY I RUN INTO IF I UNDERGO THE TREATMENT? All skin anomalies, including Seborrheic dermatitis, may inconvinience the Tricopigmentation treatment, however they don’t make it impossible. The problem is related to pigment stabilization, especially if seborrheic dermatitis is characterized by peeling. Oily skin and peeling may facilitate and accelerate pigment fading and expulsion (it is a normal action but in this specific case it is amplified). Of course we are referring to the immediate post-treatment phase. It is advisable for the patient to follow the advice of a doctor (preferably a dermatologist) by applying specific products which can restore normal skin conditions before undergoing tricopigmentation. The drawing of the hairline, required in cases of shaved effect, is a fundamental phase of the treatment. The aim is to find a balance between the patient’s requests and the practitioner’s experience and aesthetic taste. Several factors have to be taken into consideration when reconstructing the hairline of the patient, such as age, morphological features, etc. All technicians approved by Beauty Medical followed the same training. They all manage the technique and master hairline design. 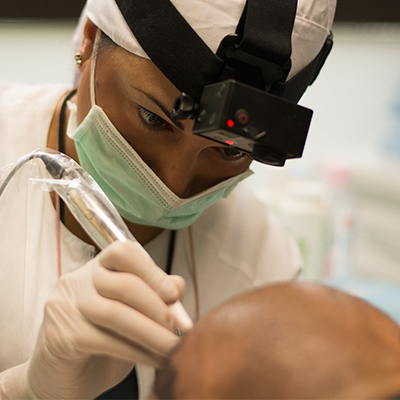 It is important to consider the customer’s expectations, the technician’s experience and the patient’s facial features. Our team analyzes every single case focusing on proportions. SHOULD I SHAVE BEFORE THE PROCEDURE? WHEN? It is advisable to shave your hair (on average 1 mm) at least 24 hours before the procedure. If the scalp is irritated, there might be more blood on the surface and this may represent an obstacle to the correct pigment stabilization. WHICH DRUGS SHOULD I AVOID BEFORE TRICOPIGMENTATION? At least 4 days before the procedure customers must stop using any topical drugs (Minoxidil, Locoidon, Scalpicin, Antiandrogens etc.) and any systemic drugs that may fluidify blood. CAN I WASH MY HAIR AFTER TRICOPIGMENTATION? During and after all tricopigmentation sessions patients must avoid washing their scalp, with or without shampoo. The day after the last session customers have to cleanse the treated area with a specific shampoo for Tricopigmentation and apply a specific serum twice a day to foster healing. CAN I DRINK ALCOHOL BEFORE TRICOPIGMENTATION? In the immediate pre treatment do not take alcohol, not even in small quantities.